Although Outlook Web App for Devices (or OWA for iOS as it’s sometimes called) received a minor update in terms of its new-found ability to display Data Loss Prevention (DLP) policy prompts, I doubt that this will excite the on-premises Exchange community, who would have much rather seen an announcement of formal support for connection of the app in on-premises deployments. That didn’t happen, so we remain in a situation where formal support is only available when OWA for Devices is used with Office 365. You can make the app work with on-premises servers, but it’s unsupported. Push notifications are what makes the little number light up on the OWA for Devices icon to indicate the presence of new messages. 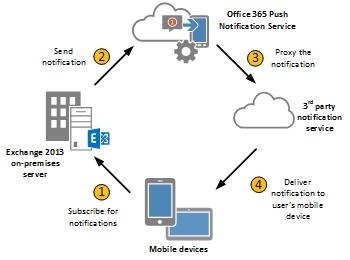 The article explains that push notifications are achieved by subscribing to the Office 365 notification service, something that is probably automatic for Office 365 tenant. Apparently, if you run Exchange 2013 CU3 or later and have a hybrid connection to Office 365, you also subscribe to the notification service, which was news to me. The article uses the following diagram to illustrate the flow of notifications. The mention of a third party notification service is interesting – I assume that this is Apple’s Push Notification Service, the use of which by Office 365 to signal the arrival of new messages to iOS devices would make sense. You’d assume that OWA for Devices on Android (should the much-rumored and natural evolution of OWA for Devices appear) would then use Google’s equivalent Cloud Messaging service for the same purpose. Perhaps the use of the third-party notification service is the component that makes it difficult to support OWA for Devices in pure on-premises deployments. It would certainly seem easier for a major player like Office 365 to make the necessary arrangements to push notifications to services run by Apple and/or Google than it would be for individual companies. If this is true, then Microsoft might have to come up with another way of pushing notifications to devices before everything would work nicely in an on-premises deployment. 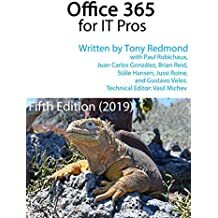 This entry was posted in Cloud, Email, Exchange, Exchange 2013 and tagged Android, Exchange 2013 SP1, Exchange Online, Office 365, Outlook Web App, OWA for Devices, Push notifications. Bookmark the permalink. Android allows apps to run in the background so push notifications aren’t required. Considering Lync 2010/2013 onprem has the ability to use the Microsoft PNS or the Apple PNS may be MSFT can incorporate this same functionality into Exchange 2013 onprem to allow notifications to be sent to the Microsoft clearing house from Exchange and then onto the respective handsets. In your article you said that “You can make the app work with on-premises servers, but it’s unsupported”. How? Because push notifications don’t work and Microsoft hasn’t formally supported OWA for Devices with on-premises Exchange. See the link in the article to the instructions about how to configure the push notifications.